The Ides of March finds a great balance between illustrating what goes on behind a political campaign while focusing on the emotional war between political players and campaign staff. It was particularly refreshing to see that the movie avoided the typical “Hollywood” take with a much more realistic approach to the story – avoiding focusing on the presidential race. 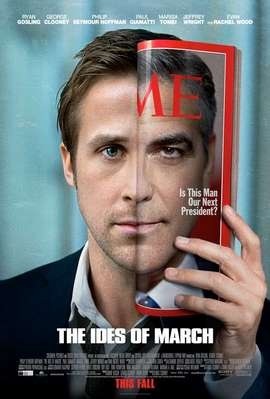 Despite lacking Hollywood flair, The Ides of March was still interesting and engaging with its share of intensity and a phenomenal cast (Ryan Gosling, George Clooney, Paul Giamatti, Philip Seymour Hoffman) that made every scene memorable. The movie’s pace was great, which I was originally a concern of mine seeing as many heavy movies tend to drag at points. The dialogue was great, which was to be expected and in my books, dialogue-driven movies are king. If you are looking for epic action and explosions, look elsewhere. The Ides of March is about the politics of politics. The movie’s biggest success is in destroying what little respect we might have left for politicians. The underlying theme was trust – trusting the campaign, the message – and how you shouldn’t always believe what you see. Overall, it was a highly satisfying movie that would review a perfect score from me were it not for a particularly disappointing ending (read below for more details). My only complaint about the virtually flawless movie was how abrupt, unexpected and unfulfilling the ending was. Ryan Gosling (Stephen in the movie) was left preparing to address the media. He was clearly struggling with the message that he was now representing – integrity – which he now felt that he lacked. However, the ending was left completely open as the movie ended before he was able to respond. Did he decide he could no longer be a part of the campaign that was all a big lie? Did he sell his soul and give up his morals to join the heartless politicians? Although I understand that some people may enjoy open-endings, I certainly do not. It always feels like a cop-out to me, as if they were not sure how to end the movie so they leave it to the audience to fill in the blanks. If I wanted to fill in the blanks with my own imagination, I would sit at home and close my eyes to write my own story. What do you think? Satisfying ending? Any indications which way it was “supposed” to end? Let me know in the comments below. My interpretation was that the ominous music at the end told the whole story. Stephen had completely “sold his sole” and the speech completed his transformation into a complete, cynical, “win at all costs”, dirty politician. The music was godfather-esc and so was his icy stare at Ida. But most of the audience agreed with you…..they groaned because they were looking for a more tangible resolution at the end. The title, Ides of March, is in reference to Caesar being murdered. My take was that Stephan was going to spill the beans and take down Caesar. The title of the movie “Ides of March” is the name given to the day Caesar was murdered in Rome. It was a politically motivated act. My interpretation is that Stephan had decided to take down Caesar. Interesting take on the title. But I still think Stephen had sold his soul and was not about to trun back to his idealistic beginning. Taking down Caesar was an evil act but taking down a sleezy politician might be seen as a good act. And it would appear that Stephen was heading in the evil direction. For some reason the end of the movie seemed like one of the Godfather movies when michael took over the reigns. Or in one of the Omen movies where Damien asserted control. Thanks for the comment Mountain Reviewer. I am personally not convinced one way or the other – which is why I didn’t find the ending to be very satisfying. Although he had seen just how ugly politics can get, it was my impression that he still had some good in him. He was playing “their game” but there was still time for him to turn it all around and that could have very well been what he did. The reference to Caesar being murdered seems to lean towards him doing the right thing.